Nothing gets me more excited than to hear that one of my must-buy authors has a new book coming out. I count the days down, giddy for what’s in store, plan my reading schedule so I can dive in to the new novel right away…Karma Brown is one of these authors for me. I’ve never had the pleasure of meeting Karma Brown in person, but I’ve been familiar with her amazing writing for quite some time. You see, Karma and I have both worked as freelance writers in the Toronto area, and her by-lines would regularly pop up in my favourite magazines. And then one day, I read a novel’s description that pulled me in. That book was COME AWAY WITH ME, Karma’s debut. It’s a beautifully written story that made Karma an auto-buy author for me. Recently, I was going through copies of the magazines that have featured my work, and I spotted the contributors’ page in an issue of Best Health, and there we both were with photos and mini blurbs! It’s my absolute pleasure to make Karma my latest guest in Authors Celebrating Authors! Karma is a Toronto Star, and Globe and Mail bestselling author, and a National Magazine Award winner, and her work has been featured by many publications including Best Health, SELF, Redbook, Today’s Parent, and Chatelaine. She has written four acclaimed novels so far: COME AWAY WITH ME, THE CHOICES WE MAKE, IN THIS MOMENT, and her most recent, THE LIFE LUCY KNEW. 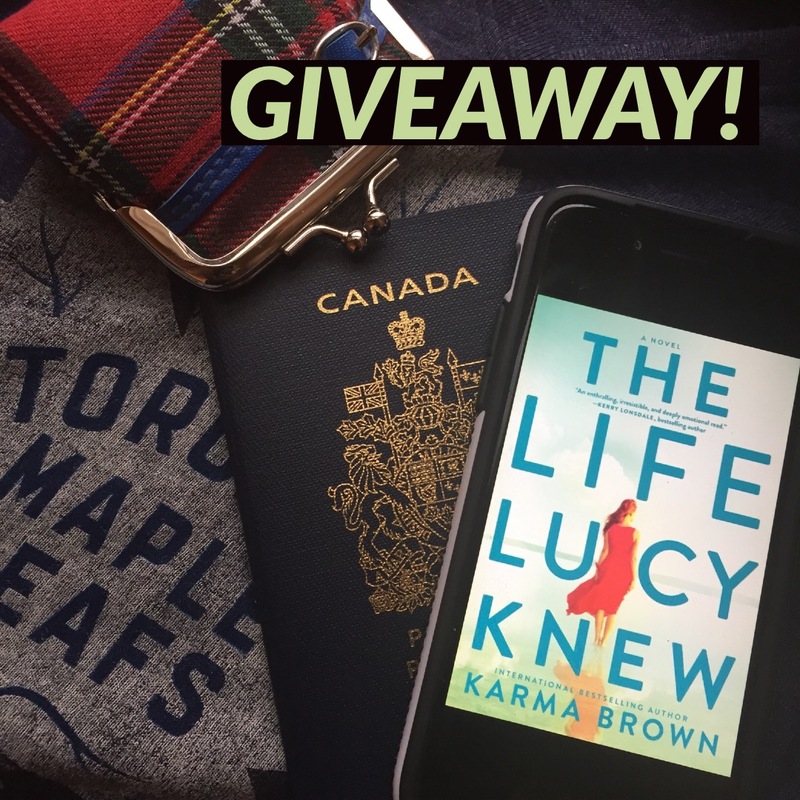 I loved THE LIFE LUCY KNEW — it’s one of my favourite books of 2018, and I can’t wait to dive into my chat with Karma! JM: What inspired you to write Lucy’s story? KB: I read a Boston Globe article about a 29-year-old North London man who had a bike accident, and after waking from his medically induced coma, had all these fantastical made-up memories that felt incredibly real to him…but were not in fact experiences he had lived through. Like many people I’ve told about this story, I had no idea confabulated memory disorder was a real condition. Or just how complex and unreliable our memories really are. As I read the piece I thought, “What if this happened to me?” and almost instantly Lucy’s character started to take shape. JM: We all cherish our memories, so the idea that we could lose those beloved recollections is absolutely terrifying! I immediately felt for Lucy and found her situation so riveting and incredibly heartbreaking, and yet, she remained strong through her emotional rollercoaster and attempts to gain what she had lost. How important is it to you to offer readers a heroine who doesn’t crumble at the first sign of trouble (and let’s face it…Lucy had every reason to curl up in a ball and hide under the duvet!)? KB: Quite important, actually. I am not a crumble-at-the-first-sign-of-trouble person (even though hiding under the duvet is a legit short-term solution), and so gravitate to writing protagonists who are imperfect (because who isn’t?) yet strong to their cores. JM: Memories influence who we are in so many ways: how we act, what we believe, who we love. Did you find it difficult to write Lucy? Characters with intact memories can be difficult to reign in and understand, but you were dealing with someone who was lost in more ways than one. KB: It wasn’t difficult exactly, but I did have conversations with my editor about this very thing: how to keep Lucy in the dark, so both she and the reader experienced the revelations simultaneously. I also had to ask myself if ‘Lucy Now’ would react to her situation similarly as ‘Lucy Before’? How was she different after she hit her head, and how was she the same? JM: Not only has Lucy lost pieces of memory, but she also has false memories—she believes that she’s married to her ex, Daniel, much to the concern of her current boyfriend, Matt. One of the things I loved most about LUCY was the unique take on the protagonist having two love interests. It felt fresh and was written in such a brilliant way that she could’ve ended up with either man or on her own. I love a story that takes the reader on a journey and you’re not sure how it’s going to end. Without giving away any spoilers, did you ever envision a different ending? JM: I loved this book’s setting—TORONTO! Let’s hear it for my hometown. It’s not often that I find women’s fiction or romance that takes place here and I ate up all the Toronto references and locations. As a fellow Canadian author, I always toy with this dilemma – should I set my book here or somewhere else? What made you set the story here? KB: I’m so glad to hear you enjoyed that aspect! I typically—at the recommendation of my publishing team—set my books in the U.S., but I felt compelled to make this a Toronto story, and so pushed for a local setting. Again, I’ll blame Lucy. It was her idea to live in Toronto, and who am I to argue? JM: Hey, Lucy is a pretty smart gal! I wouldn’t argue with her either. Is there a message you’d like readers to take away from THE LIFE LUCY KNEW? KB: I tend to write stories where the reader is dropped into the protagonist’s world at the worst moment of her life. I’ve long been fascinated with how people not only survive these sorts of challenges, but find ways to thrive through them. I wanted Lucy’s decisions to be clear choices, because while life can throw curveballs—some of them devastating—the power to choose how we respond to them is one of our greatest strengths. JM: Let’s touch upon writing and how you go about creating such wonderful novels. Do you plot out all the twists and turns early in the writing process, or do they just happen as you go along? KB: I call myself a “plantser,” which I define as a plotter (plot with rigidity) with pantser (plot by the seat of your pants) leanings. As soon as I have solid idea I write a synopsis—which essentially outlines the plot, characters, setting details, and gives a well-rounded overview of the idea—and then I begin drafting. Once I’m into the story I worry less about following my synopsis and more about developing the characters and letting them lead me. Usually the big things stay the same, but there are always fun surprises along the way! KB: I start with a “What if…?” question. Usually an idea is sparked by something I’ve read, or a story I’ve heard, and then I start to brainstorm. If I can easily answer the “What if…?” question, I know I’m on to something. However, I need both a strong sense of character and an undeniably compelling situation to put her in for a novel to have “legs.” Once I have those clearly in mind, I’m on my way. JM: You’ve mentioned on social media that you often get up at 5 a.m. to write before your family wakes. What does your writing routine look like? KB: When I’m actively drafting or revising a book I’m typically up before 5 a.m. – including on the weekends – to write (yes, yes, I have been told this is bananas). It’s quiet, my mind is clear after a night of sleep, there’s fresh coffee, and I’ve found it to be the best time to solve problems and be creative. As the day wears on my inbox fills and other responsibilities take over, and it’s hard to get in the right head space to write. Of course, it means I have to keep toddler hours and am in bed by 10 p.m.! JM: Some writers get inspired while listening to music, others have ideas pop into their heads while cooking or walking the dog. When do your best ideas hit? 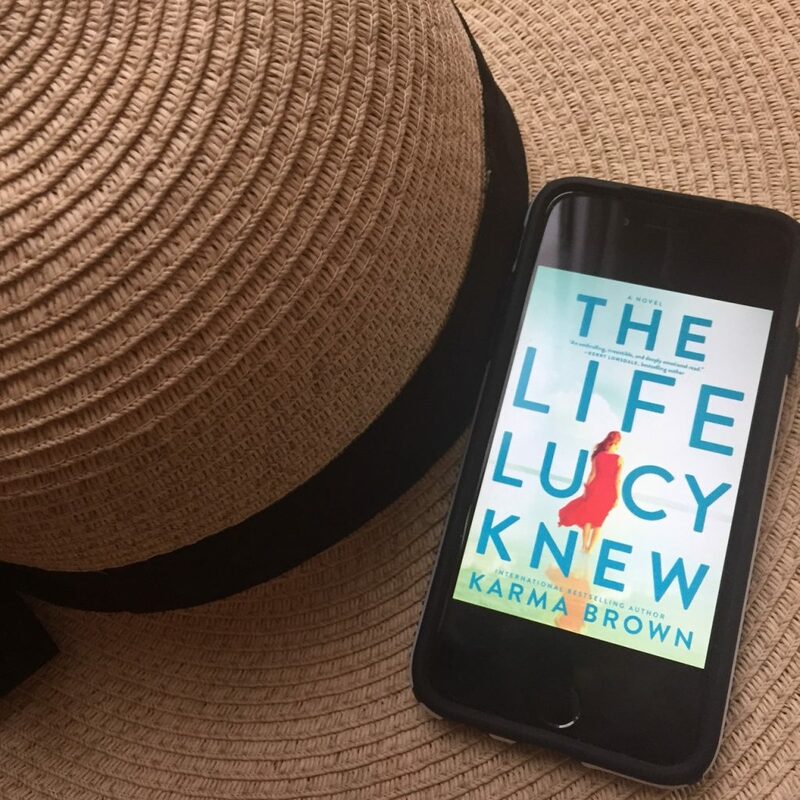 JM: I’ve loved all of your books, but THE LIFE LUCY KNEW has joined COME AWAY WITH ME as my Karma Brown favourite (and one of my top picks for 2018). Do you have favourite romance novels or movies that have stayed with you? KB: My favourite love story remains THE TIME TRAVELER’S WIFE, by Audrey Niffenegger. It has been 15 years since that novel was published, but Henry and Clare–and their mystical, time-hopping, and heartwrenching story–will stick with me forever. JM: What has been your proudest moment as an author so far? KB: Recently a woman about my age—a widow—told me how comforting it had been for her to read COME AWAY WITH ME, and how grateful she was for my book. There is no better moment as an author than hearing that. JM: You’ve published four must-read books. Karma, do you have advice for aspiring writers? You never know which idea will land you an agent or publishing contract—in this industry timing can be everything. The book I signed with my agent didn’t end up selling, but my next idea, which I worked on diligently through the long, failed submission process, did! If you hesitate to get others’ eyes on your manuscript—the idea of “constructive” (read: less-than-shining) criticism making you squeamish—you are not ready for the job. There is a lot of rejection. Like, A LOT. Even after you’ve published one book…or a handful. So be prepared to fail spectacularly, all the while remaining hopeful someone will love your book as much as you do. I’ve watched a lot of authors hold out with one idea, one book. Sometimes for years. Which serves no one, especially the author. Perhaps it’s not the right time for that idea (see above)—remember when vampires were the rage, and it seemed everyone had a vampire book in the coffer? Or perhaps—and this can be hard to swallow—the book simply isn’t good enough yet. Either way, it’s a balance between staying the course and believing in your book and setting it aside to work on something new and fresh. That book you set down might end up being the right one later, but it’s important to know when to let it go and move on. My debut was not my first book written—I have two “practice” books gathering dust in a drawer, where they will now live for all of eternity. KB: Am currently polishing up a book that comes out next year (April 2019) with Viking Canada. It’s about a reluctant, modern housewife named Alice who finds a cookbook buried in an old box in the basement of her new home and becomes captivated with the cookbook’s previous owner, Nellie–a 1950s housewife. Dissatisfied with her own life and losing her grip on reality one retro recipe at a time, Alice will decide how far she’s willing to go to get the life she wants. A slight shift for me to darker territory, but I’m really excited about this one! Thank you so much, Karma! Want to purchase THE LIFE LUCY KNEW? It’s available from all major retailers including Amazon, Barnes and Noble, and Indigo. You can also follow Karma on social media. Follow her on Twitter, Facebook, and Instagram, and visit her website to discover her latest news, and read more about her brilliant books. GIVEWAY IS NOW CLOSED! THANK YOU FOR ENTERING! All our memories are precious, but which one would you be most devastated to lose? Please note: comments on my website have to be approved manually, so if you don’t see your answer showing up in the comments right away, don’t panic! It’s just awaiting moderation and once that’s done, it will appear. Tag two friends who might be interested in this wonderful giveaway! Entries will be accepted here in my blog’s comments until Thursday, June 14/18 at 5 p.m. ET. Winner will be contacted by email and will have 24 hours to confirm their mailing address. Myself and Karma are not responsible for prize packages lost in the mail. (countries eligible for this giveaway are determined by the PR company/publisher, not Karma Brown, or myself). This giveaway is not associated or sponsored by Instagram. GOOD LUCK! I hope I win. Thank you for the opportunity ❤️. Lost memories of my husband and children would be devastating to me. Of course this is contemplating this loss on the side of intact memories. On the other side, I can imagine the general loss of the feeling of safety and security would be daunting. Memories of our family’s last few days with my grandfather when he was still lucid just before he passed away will stay with me forever and if I lost these I’d be devastated. Those last few days were so meaningful and the smile on his face when I told him I had finally found true love (something he’s wanted for me for a long time) will stay with me forever. I have very few memories of my father from when I was younger and with his passing recently I’d be heartbroken to lose any of them. All my memories with my grandma (she passed away when I was a teenager in high school), in particular, her in old flowered housecoat cooking breakfast for my family. I would be devastated if I lose the memory of 15th birthday, it was a Harry Potter themed party and most of my family and friends were dressed up as characters and my mom made scarfs with the color houses, a photo booth area and a dessert table inspired by the books and movies. I had a lot of fun that day.